YES! I want simple, fast results. Order Now. 100% Satisfaction Money Back Guarantee Less shipping and handling. Select to open dialog. 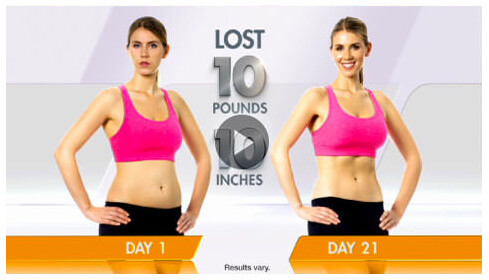 Want amazing results in 21 days? Then all you need is 21 Day Fix. Achieving your fitness and weight-loss goals has never been faster—or simpler. Watch the 21 Day Fix Video. Yes, really! You can lose the weight. Know why most diets don't work? Because they don't make it easy to lose weight and keep the weight off. 21 Day Fix makes it simple to enjoy the foods you love—without calorie counting! Here's why 21 Day Fix works. It's not another diet. In fact, it's EXACTLY the opposite. 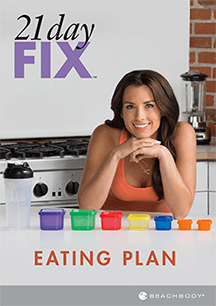 21 Day Fix lets you EAT! Only in just the right portions, so you don't feel miserable and deprived—but you CAN finally start losing weight. What's the secret? Our seven exclusive containers. Each one is color-coded for a different kind of food, and pre-measured for the precise portion. You'll never have to "eyeball" your measurements again—if it fits in the container, you can eat it! Combine this eating plan with one 30-minute workout a day. That's all. It's that simple! You don't have to eat directly from the containers. Create delicious meals by tossing all your ingredients into a bowl to make a healthy and filling pasta or salad—just like this one! 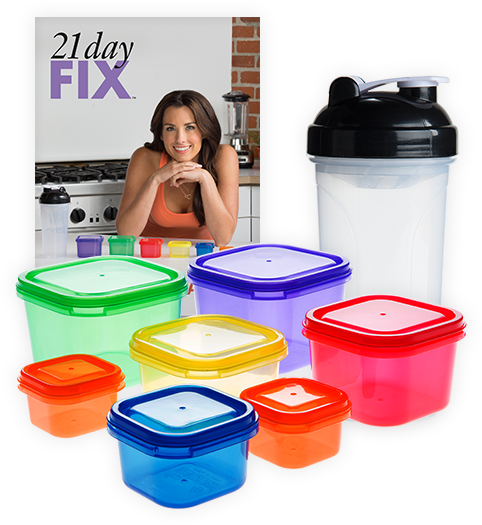 What do you get with 21 Day Fix? Everything you need to lose weight. Simply and quickly. Clickthe containers to learn more! No more calorie-counting. And NO starving! Ready for a major calorie burn in only 30 minutes? We made these workouts short so you can get in, get out, and get on with your day. The workouts will challenge you at every level to help maximize fat loss. And there's always a modifier on screen to show you how to dial down the intensity without losing the benefits. Keep your heart rate up and your metabolism revved high long after the workout is over. Targeted resistance training helps shape your chest, back, shoulders, arms, and abs. Firm and tone your entire lower body while you blast fat and burn calories. Strengthen your core, elongate your muscles, and firm your hips and thighs. Get your heart pumping and your body moving as you melt away the pounds. Improve your balance, flexibility, and strength as you help relax your muscles. Forget about counting, cups, and calories. When it comes to losing weight, simplicity equals success. These seven color-coded containers and Shakeology® shaker cup deliver exactly the right portions every time, so you never eat too much or (too little). Fill them up as directed in the Eating Plan - and you will lose the weight! Start seeing results immediately! This quickstart guide and workout calendar shows you just how simple it is to achieve your weight-loss goals. This simple Eating Plan takes you step-by-step through the process and makes portion control so easy, you won't even have to think about it. Enjoy delicious, healthy food without counting calories, and watch the pounds fall off. Get beach-ready in 72 hours! This is Autumn's secret weapon for losing weight fast before a competition or photo shoot. Do it during the last 3 days of 21 Day Fix for mind-blowing "after" pictures. 4 rounds of fat-burning exercises help carve out a leaner, stronger physique. 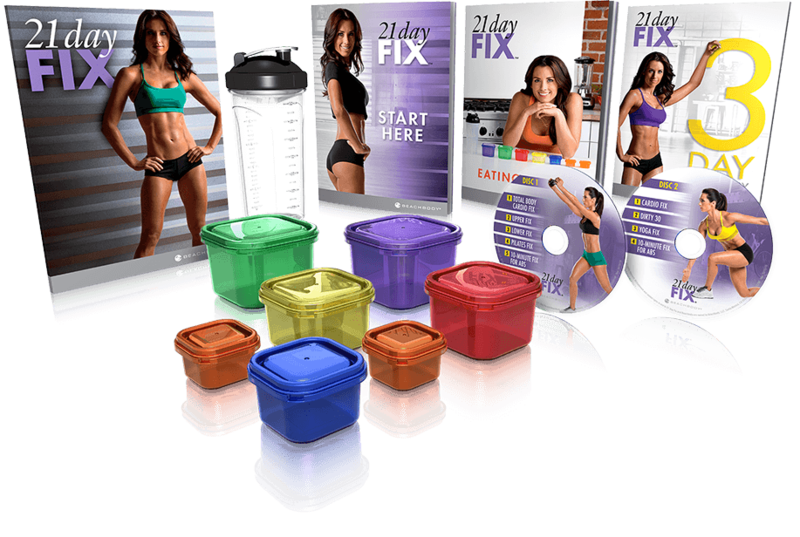 Get extra support and motivation from weight-loss experts and other 21 Day Fix customers. How much weight do you want to lose? Each round of 21 Days will get you closer to your goal! "Who is that guy on the left? This is me now. I don't even know who that first guy is. Now, after the 21 Day Fix, I look amazing." "The way I look and the energy I have is just fantastic. I feel like I’m at least 20 years younger. It's never too late to lose the weight. 21 Day Fix has definitely changed my life." TRY 21 DAY FIX NOW! Not sure? Results guaranteed or your money back. Still not sure if it'll work for you? Let us make it even simpler. We're going to let you try the entire program—the full 21 days—and if you don't get the results you want, simply send it back within 30 days for a full refund of the purchase price (less s&h). Think about that. You don't have to wonder if 21 Day Fix is going to work. You get to finish the program and then decide if you want to keep it. That's how convinced we are that you're going to love your results. So go ahead and try it for yourself. knows how to get results! "I'm a bikini competitor—and a single working mom. I don't have time for complicated meal plans and hours of exercise, and neither do my clients. That's why I created 21 Day Fix. It's simple, fast, and will help you get results. All you have to do is follow my program, and you WILL lose weight. I promise—or your money back." The CEO told us, "Let me see if the 21 Day Fix works." "I had just 3 weeks before I was supposed to reveal this new product to a few hundred of our distributors, so I decided not to just show them the product, but show them what's possible. I literally took this Day 21 photo in my hotel room the morning I had to present the program. Needless to say, I was blown away at my 12-lb. weight loss and visible transformation in 21 days. And based on the gasps I heard in the convention hall, the crowd was too." †Results vary. Exercise and proper diet like recommended in the 21 Day Fix program are necessary to achieve and maintain weight loss and muscle definition. ‡Results achieved with continued use of 21 Day Fix. Consult your physician and follow all safety instructions before beginning this or any exercise program and nutrition plan. *30-Day Money-Back Guarantee. If you're not satisfied with your results within 30 days, simply call Customer Service for a Return Authorization number to return the product for a full refund of the purchase price, less s&h—no questions asked. © 2015 Beachbody, LLC. All rights reserved. Beachbody, LLC, is the owner of the 21 Day Fix, Shakeology, Beachbody, and Team Beachbody trademarks, and all related designs, copyrights, and other intellectual property.